We offer various styles of remote filter, which can be supplied as part of an induction kit or as a standalone canister. 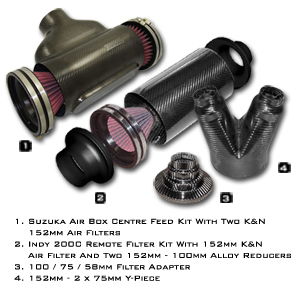 Our induction kit filters add the possibility of using ram air scoops to feed the engine and with models rated up to 1000BHP you’re sure to find the right kit for your vehicle. Our high flow models can be used to supply high powered engines with the air they need or used in endurance races on lower powered engines to ensure there is no loss of air flow during the race. We offer a range of adapters allowing the air boxes to be used with any of our scoops and various inlet ducts and Y-pieces allowing for easy fitment and routing of ducting.